Posted Apr 21, 2018 by Eds. In the last month there has been a deliberate, determined attempt to turn the clock back on the general election result on 8th June 2017, to back when the left could be dismissed as irrational deluded cultists who mostly existed on social media. It’s a longing amongst media commentators and politicians to restore old certainties about how British politics worked, a world they could easily navigate around, one which made sense. Actually, it’s a lot worse than that. 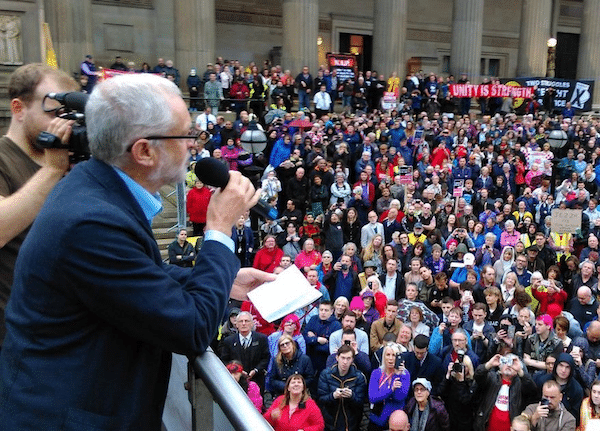 There’s a determined effort in both the British media and the wider political elite to delegitimise the Labour leadership in particular and the broader left as a whole. By that I mean: to treat the Labour left as not simply wrong, but politically illegitimate; and to treat any support for the Labour left is a moral disgrace, just 10 months after 40% of the electorate voted for a left-led Labour Party. The Official Opposition and its supporters are stooges of foreign powers and terrorist sympathisers (the sort of rhetoric used by authoritarian regimes to delegitimise their opponents); they are equivalent to fascists and Nazis; they are thugs, bullies, would-be totalitarians. This isn’t just propagated by the Tory right, but amongst (misleading term alert) so-called “centrists”: amongst each faction, the atmosphere is one of increasing hysteria. The portrayal of Labour’s leadership as terrorist sympathisers and outright supporters has been there ever since Jeremy Corbyn first stood for leader, of course: during the general election, the Daily Mail dedicated 13 pages of coverage denouncing Corbyn and his allies as terrorist supporters. In the last few months, from the ludicrous Czechoslovakian spy smear story to the attempt to portray the Labour leadership as stooges of Vladimir Putin or Bashar al-Assad, there has been doubling down on the ‘allied to hostile foreign powers’ trope. Which, ironically enough, is how Putin likes to portray his own opponents. Then there has been the issue of the sickening disease that is anti-Semitism, which does exist on the left, and which some remain in denial of. Anti-Semitic tropes and outright abuse have been deployed by some self-described leftists. It’s an issue which has to be confronted, unapologetically, with every anti-Semite driven without remorse from the party: that’s something I’ve spent the last few weeks talking about and writing about, as have more importantly prominent Jewish leftists like Michael Segalov, Rachel Shabi, Jon Lansman and Rhea Wolfson. Yet this very real issue is being used by some to treat the entire left as riddled with anti-Semitism; that rather than supporting constructive action to eliminate anti-Semitism, nothing other than the resignation of the entire Labour leadership and the disappearance of the Labour left will be satisfactory. The left is presented as totalitarian extremists. The Tory Cabinet Minister Saajid Javid even used Parliamentary privilege to denounce Momentum as “neo-fascist”. Then there’s the attempt to present any left-wing criticisms or arguments as abuse. The vast majority of the British press backs the Conservative Party; the Labour left has almost no support in the media; in the commentariat the left remains a besieged, marginalised force. And yet if left-wingers use their platforms to criticise elected politicians or an overwhelmingly hostile media, that is presented as inciting abuse. My own Twitter timeline is a cesspit, a never-ending pile-on of Tory MPs, of right-wing or supposed ‘centrist’ commentators united by an obsessive, all-consuming hatred and fear of the left. More broadly, every day my timeline brings a blend of threats of death and violence, homophobic bile, and general abuse. That’s not a plea for sympathy: it’s that right-wing abuse is completely ignored, because it is politically inconvenient when forming a narrative that it is the left who are abusive and hateful. Given there’s still a lack of left-wing commentators with significant media platforms because for entrenched institutional reasons, which the left is trying to work to challenge (it’s hard, I’m afraid), it’s a duty on my part to try and redress the balance of a hostile and media elite which is, as I’ve said, delegitimising the Official Opposition. That means challenging attacks from both the Tories, elements of the Labour Party who are a bitterly opposed to a left-led government taking power, and an institutionally biased British media. I’m afraid my own limited platform does not offer a sufficient counterweight to an axis ranging from almost the entire British press to the Tory Party to a well-connected chunk of the Parliamentary Labour Party. Which brings me to an illuminating case study. Angela Smith is a Labour MP who is vehemently opposed to the Labour leadership and the Labour left. In the run-up to the local elections, she wrote an article for Murdoch-owned Times newspaper attacking her party’s own policy on renationalising the water industry which polling suggests 83% of the public support; with even the Financial Times calling water privatisation an organised rip-off. I retweeted a thread by the brilliant investigative journalist Solomon Hughes detailing Smith’s links to private water companies, adding that it was “an absolute shocker”, which it is. This triggered her husband, and Parliamentary researcher, Steve Wilson to describe me as a “very poor opinion writer”, which Smith retweeted. Now, whatever you think about my opinion writing, I owe my own position far more to merit than someone appointed on the basis that his spouse is a Member of Parliament. By sharing Smith’s links to private water companies and responding to her and her husband’s attack, I was accused of inciting an online pile-on, of inciting abuse. A journalist and political campaigner holding an elected politician to account was evidence of the abusiveness of the left. Now, forget that left-wing politicians — Laura Pidcock and Clive Lewis among them — are subjected to relentless online pile-ons from both Tory and Labour MPs and hostile commentators. Forget too that left-wing journalists like Abi Wilkinson, Ellie Mae O’Hagan and Liam Young are subjected to the same. That would, of course, expose the utter absurd hypocrisy of those seeking to shut down any and all scrutiny or criticism of the left as abusive and bullying. The same, too, when I went on Newsnight a few weeks ago and criticised the BBC for discussing whether Corbyn was a Russian stooge in front of background mocked up as a Soviet poster. By doing so, I was accused of inciting abuse against a Newsnight producer (who I like and respect very much) who I never even mentioned because she did her job and defended her programme on Twitter, and some of those who responded were abusive idiots. This is produced as evidence that, again, I’m an abusive bully, inciting pile-ons simply by going on television and criticising media’s bias — or indeed using my platform to express a view held by every single member of the Labour left. Speaking out against media bias is now apparently incitement to abuse. There is a massive disconnect between where the media is and the political reality of the country. Rather than attempting to bridge that gap, the media is doubling down, and treating the left as barbarians at the gate who have to be kept out at all costs. So-called ‘centrist’ commentators who represent almost no substantial body of public opinion are back to treating the left with derision and contempt. It is going to get more hostile and more difficult, I’m afraid. But it is worth pointing out what is going on. The attempt to delegitimise the left will intensify, and get much more sinister.